THE Melbourne playing group spread far and wide on Thursday to visit the community and impart some wisdom to school students around Victoria. Defender Sam Frost ventured to the South-East suburbs where he spoke to a range of kids at both primary and secondary level. “We had three schools – a couple before lunch and one more after lunch,” Frost told Melbourne Media. Frost enjoyed the opportunity to educate the students and said there was a different focus this year when it came to their messaging. “Often there’s a lot of general stuff like good diet, good habits and what we do day to day,” he said. “But this time around we angled it more towards leadership and gratitude as the two main themes. “I had a couple of schools today where we just dealt with school captains, talking about leadership. “And then the general gratitude stuff is something we’re working on at the club as well, and it’s something we want to feed into what we talk about. 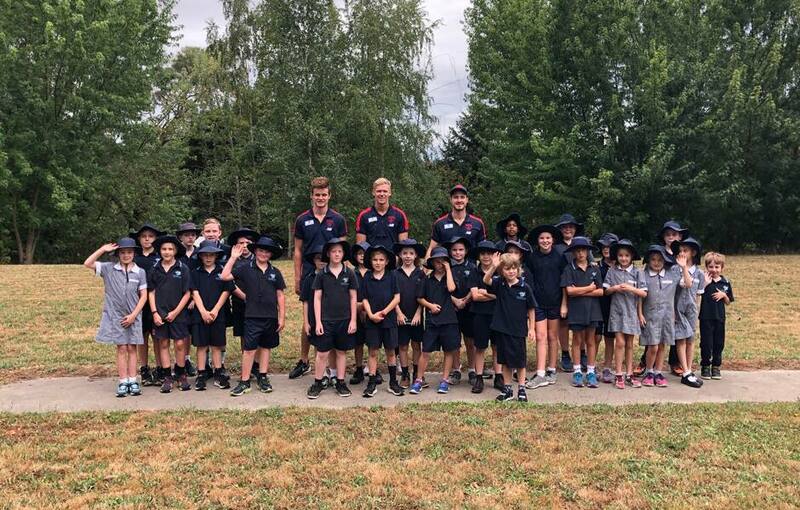 These community visits allow the players to get away from AAMI Park for the day and pass on some valuable messages – a chance Frost doesn’t take for granted. “It gives you the opportunity to take your own experiences and your own learnings throughout your school and footy, and communicate stuff that you wish someone would’ve told you back then to help you out,” he said. “So it’s a good chance to hopefully help someone else or at least teach someone something. The 25-year-old knows just what it’s like to meet your AFL heroes and understands the excitement that these community visits can build. “I remember players coming to footy training and it was just pretty cool having them around,” Frost said. Frost is now living his dream as an AFL player and is travelling along nicely this pre-season. The players returned from Maroochydore on Tuesday afternoon after a week-long camp which was universally enjoyed. “Maroochydore was good. We fit a couple of big game-size sessions in and spent a good bit of time together as a group just hanging out and had a bit of downtime to chill out,” Frost said. On a personal note, Frost has been at full fitness over summer and barring one minor incident last week, he’s on track for some big hit-outs in the JLT Series. “I’m feeling good. I had a bit of a knock in the second session last week and just took it easy in the third session, but I’ll be back in full training this week,” he said. After months of hard work, the season is finally in sight for the playing group and Frost says the anticipation is quickly building. “The schedule starts becoming a bit more like the real season,” he said. “I think we’re only in the pre-season schedule for another week or two and then I think it’s practice matches after that. Melbourne’s first JLT Series match will be played against Richmond on Sunday, March 3 at Deakin Reserve in Shepparton.